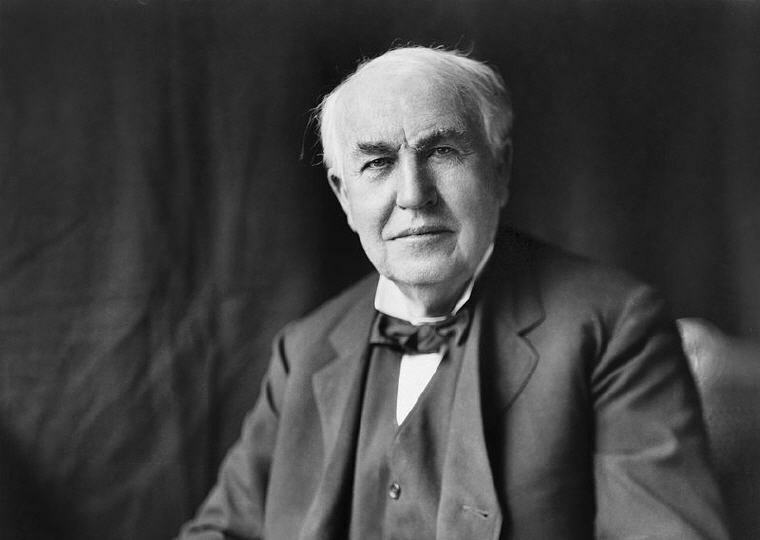 Excerpt from Wikipedia: Thomas Alva Edison (February 11, 1847 – October 18, 1931) was an American inventor and businessman. 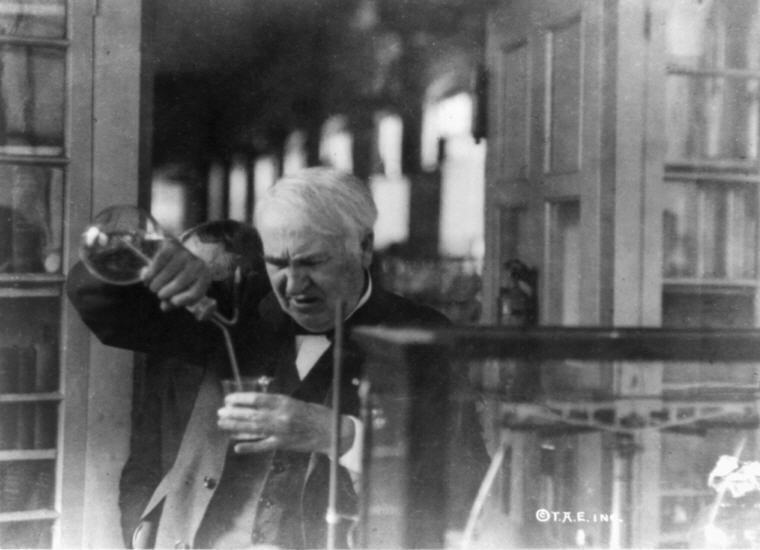 He developed many devices that greatly influenced life around the world, including the phonograph, the motion picture camera, and a long-lasting, practical electric light bulb. Dubbed “The Wizard of Menlo Park”, he was one of the first inventors to apply the principles of mass production and large-scale teamwork to the process of invention, and because of that, he is often credited with the creation of the first industrial research laboratory. On his years of research in developing the electric light bulb, as quoted in “Talks with Edison” by George Parsons Lathrop in Harper’s magazine, Vol. 80 (February 1890), p. 425. 1. During all those years of experimentation and research, I never once made a discovery. All my work was deductive, and the results I achieved were those of invention, pure and simple. #2 Presented as a statement of 1877, as quoted in From Telegraph to Light Bulb with Thomas Edison (2007) by Deborah Headstrom, p. 22. 2. Many of life’s failures are people who did not realize how close they were to success when they gave up. 3. The doctor of the future will give no medicine, but will instruct his patient in the care of the human frame, in diet and in the cause and prevention of disease. #4 As quoted in An Enemy Called Average, 1990, John L. Mason, p. 55. 4. Opportunity is missed by most people because it is dressed in overalls and looks like work. 5. Genius is one percent inspiration, ninety-nine percent perspiration. 6. Everything comes to him who hustles while he waits. #7 Quoted in Motivating Humans: Goals, Emotions, and Personal Agency Beliefs, 1992, Martin E. Ford, p. 17. 7. If we did all the things we are capable of doing, we would literally astound ourselves. 8. I never did anything worth doing by accident, nor did any of my inventions come indirectly through accident, except the phonograph. No, when I have, fully decided that a result is worth getting, I go about it, and make trial after trial, until it comes. 9. I find out what the world needs. Then I go ahead and try to invent it. #10 The Diary and Sundry Observations of Thomas Alva Edison, 1948, p. 110. 10. Restlessness is discontent — and discontent is the first necessity of progress. Show me a thoroughly satisfied man — and I will show you a failure. 11. My mind is incapable of conceiving such a thing as a soul. I may be in error, and man may have a soul; but I simply do not believe it. What a soul may be is beyond my understanding. 12. Nature is what we know. We do not know the gods of religions. And nature is not kind, or merciful, or loving. If God made me — the fabled God of the three qualities of which I spoke: mercy, kindness, love — He also made the fish I catch and eat. And where do His mercy, kindness, and love for that fish come in? No; nature made us — nature did it all — not the gods of the religions. #13 In conversation with Henry Ford and Harvey Firestone (1931); as quoted in Uncommon Friends: Life with Thomas Edison, Henry Ford, Harvey Firestone, Alexis Carrel & Charles Lindbergh (1987) by James Newton, p. 31. 13. We are like tenant farmers chopping down the fence around our house for fuel when we should be using Nature’s inexhaustible sources of energy — sun, wind and tide. … I’d put my money on the sun and solar energy. What a source of power! I hope we don’t have to wait until oil and coal run out before we tackle that. 14. Hell! there ain’t no rules around here! We are tryin’ to accomplish somep’n! 15. I have friends in overalls whose friendship I would not swap for the favor of the kings of the world. #16 As quoted in Artifacts: An Archaeologist’s Year in Silicon Valley (2001) by Christine Finn. p. 90. 16. Just because something doesn’t do what you planned it to do doesn’t mean it’s useless. 17. I never did a day’s work in my life, it was all fun. #18 Diary entry, as quoted in Defending and Parenting Children Who Learn Differently: Lessons from Edison’s Mother (2007) by Scott Teel, p. 12. 18. I owe my success to the fact that I never had a clock in my workroom. Seventy-five of us worked twenty hours every day and slept only four hours — and thrived on it. 1. I have not failed. I’ve just found 10,000 ways that won’t work. 2. The three great essentials to achieve anything worthwhile are, first, hard work, second, stick-to-itiveness, third, common sense. 3. Unfortunately, there seems to be far more opportunity out there than ability. We should remember that good fortune often happens when opportunity meets with preparation. 4. Our greatest weakness lies in giving up. The most certain way to succeed is to try just one more time. 5. Failure is really a matter of conceit. People don’t work hard because, in their conceit, they imagine they’ll succeed without ever making an effort. Most people believe that they’ll wake up some day and find themselves rich. Actually, they’ve got it half right, because eventually they do wake up.